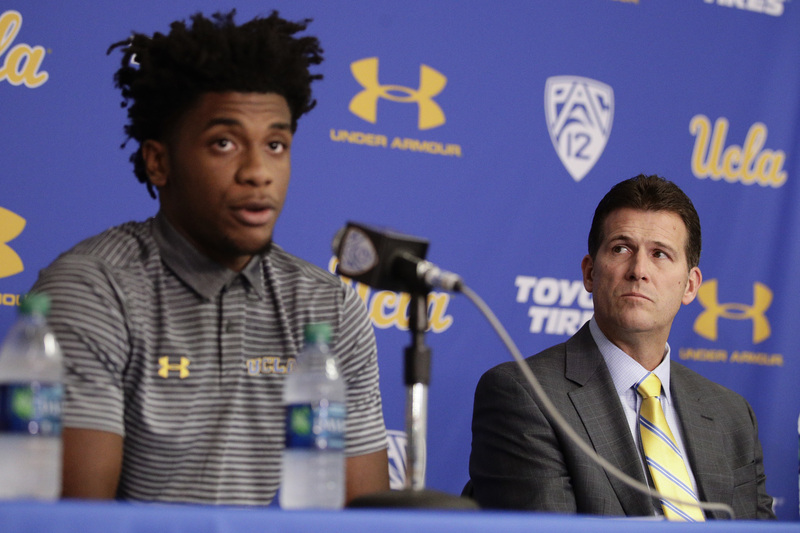 WASHINGTON (AP) — President Donald Trump urged three suspended UCLA basketball players on Thursday to thank China’s president for their freedom after they shoplifted in China. Freshmen LiAngelo Ball, Jalen Hill and Cody Riley were detained in Hangzhou for questioning last week before the Bruins beat Georgia Tech in their season-opening game in Shanghai. The rest of the team returned home Saturday. Athletic director Dan Guerrero said the shoplifting occurred when the team had 90 minutes of free time on Nov. 6 in Hangzhou. He said the three took items from three stores. The players are suspended indefinitely, and coach Steve Alford says they will have to earn their way back onto the team. Tags: #DonaldTrump, Ball, basketball, China, collegebasketball, UCLA. Bookmark the permalink.